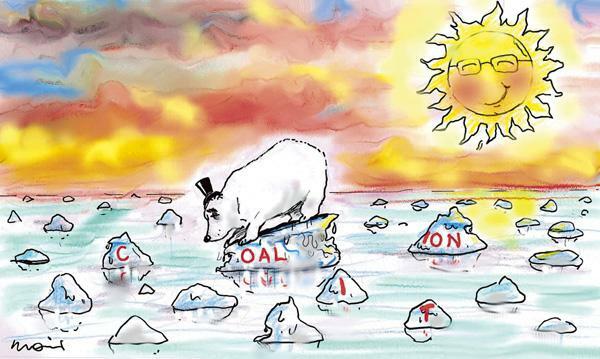 The Coalition is successfully self-destructing over climate change. By playing hard ball politics on the emissions trading scheme (the wedge) the Rudd government has successfully fractured the Coalition. The Nationals are off on their own as their diehard climate change sceptics prepare to die in the ditches. The conservative western Australian Liberals have adopted the tactic of internecine conflict with their fellow Liberals. Many of the other conservatives enjoy seeing Malcolm Turnbull's carcass swing in the breeze. The Coalition will be out of power for a couple of elections, if not a decade because its self-destructive tendencies are making the party electorally unattractive. They are in the grip of a death wish. The dinosaurs and relics from the past have yet to grasp the significance of environmental politics for Australia's economy; they think that acting as the mouth piece for the interests of the old polluting energy industries and King Coal is clever politics; and they still cling to the myth of unfettered growth. The political reality is that the political taunting by Rudd + Co have reduced them to a shambles during in Question Time, an their twisting and turning to avoid the sharp edges and pincers of environmental politics indicates that they have little understanding of the relationship between the economy and its environmental support systems. The days of unfettered growth, the exploitation of nature by an unregulated capitalism are over, now that it is realised that the externality of global heating caused by economic growth fueled by electricity generated by fossil fuel represents a massive market failure. As the economists say, the climate is the quintessential "commons," the public good that is free to everyone, and therefore valued by no one. But even now that we understand its value, and the risks of continuing to overburden it, the market cannot possibly fix the problem of its own accord. It is simply incapable of factoring in the very long-term costs and benefits, of giving them sufficient weight, to drive the investments that are needed in the short-term. That is why government must give it direction. But given the right direction and the right incentives, harnessed instead of stifled, the market can be a very powerful force for climate protection. the new rules of the market is that the climate will stop being free. There will be a cost for emitting carbon. The response of the dinosaurs is that Australia cannot afford an emissions trading scheme or to reduce greenhouse gas emissions to prevent global overheating now. Jobs will be lost. Industries will go off sure. Yet the economic models so far do a poor job of projecting how rising energy prices will lead producers or consumers to substitute other goods and services; how price signals will drive new technology and innovation; or how businesses will respond to changes in policy. The models also have a difficult time weighing the near-term costs of emission reduction against the long-term benefits of avoiding climate change impacts. They're not so much wedged as scattered. Is there one issue they all agree on apart from hating Rudd? Has a week gone by since Turnbull became leader that one them hasn't said or done something incredibly stupid? Lyn says "They're not so much wedged as scattered." ----sounds pretty right to me. It's what the Moir cartoon says. They are all over the place; at sixes and sevens; exploding in all directions. how about the wedge politics played By Rudd + Co has caused the scattering of the Coalition into bits and pieces? I always type 'coalition' as 'COALition'. Then again, climate skeptics in conservative political parties - all three of them not on the cross benches - and those in Big Carbon who only fake their skepticism - seem to have one the battle against the scientific community. How does the policy of KRudd and Wrong differ substantially as far as carbon emissions by Australia and as a result of Australian income (e.g. coal exports) from that put forward by Turnbull when Howard was Prime Minister? So... have the forces who usually use the Liberal and National Parties to advance their interests won even if their preferred party has been weakened? Why should those forces care about the Liberal Party any more when the ALP seems little different, except to have the Libs/Nats strong enough to keep the ALP "honestly" in it's centre-right big-end-of-town-friendly position? The only joy to be had out of the whole thing is watching the political theatre. The policy is, as you point out, shite. The Nationals are getting together for their annual hoe down to work out how best to oppose all climate change policy. I get the impression they don't want your vote. The Nationals say that if no one else stands up for regional Australia and country jobs (eg., the unions), then the Nationals will have to. Apparently the Nationals say that they stand for a "triple bottom line" of creating and maintaining strong regional economies, secure communities and a sustainable environment. I wonder what they mean by 'sustainable environment'. Economic viability? The Nats really confuse me. If you go to the National Farmers Fed site you'll find that they reckon, officially, that climate change is a major challenge to farmers, THE major challenge even. And I think I've posted here before that I have a lot of contact with farmers here in SA and all those I have met, no exceptions, readily admit climate change is occurring. Lots of them have climate records for their properties that they or their family have kept for yonks where yonks is a very long time. And they see it in the form of rainfall patterns changing and are worried about what to do about it. Maybe I meet a subset of farmers, I'm talking SA for starters, but it really does seem to me that there is a disconect between farmers and the leadership of the Nats. If the greenies say it its gotta be wrong even if it is right? The Nats confuse themselves, as well as everyone else (see Gary's comment). They are worried about hating greenies, but they're also worried about their own viability. Maybe they're trying to shore up support in more northern electorates where it still rains. the farmers are concerned that the extra costs an emission trading scheme will impact heavily on their farm production. That is how the Nationals leadership has got to them--through the traditional fear of Labor. Labor will tax them into the ground through an ETS. you are right. There are internal divisions within the political parties as well as between them---the ALP is deeply divided between the environmentalist and trade unionist. So are The Greens. The Nationals may well be the exception on this.